UPDATE 1 (December 7, 2011): In the post, under the heading of ON THE IPCC’S CONSENSUS (OR LACK THEREOF) ABOUT WHAT CAUSED THE EARLY 20th CENTURY WARMING, I referred to the Lean et al (2002) paper “The effect of increasing solar activity on the Sun’s total and open magnetic flux during multiple cycles: Implications for solar forcing of climate.” I was unable to find a copy of the paper before publishing the post, but at the Tisdale schools the website “Skeptical Science” on CO2 obsession cross post at WattsUpWithThat , blogger kadaka (KD Knoebel) provided a link in his December 7, 2011 at 1:48 pm comment. Thanks, kadaka (KD Knoebel). I rarely visit the website SkepticalScience, which is run by proponents of anthropogenic global warming, because most of their posts are the simple parroting of the findings of others—the IPCC’s AR4, the climate science paper de jour, etc.—as they relate to a global climate driven by anthropogenic forcings, primarily CO2. Unfortunately, while doing a Google blog search of my name, I found SkepticalScience had referred to me and my website in one of theirs, so I had to check it out. The SkepticalScience post dated November 22, 2011, Pielke Sr. Misinforms High School Students, refers to me by name, or to my posts, a number of times while they attempted to discredit Roger Pielke Sr’s post Q&A For Climate For High School Students. In looking at their comments, SkepticalScience appears to be unable to grasp topics of discussion and fails to disguise their use of the common debate tactic of misdirection. I’ll address those initially in the following. 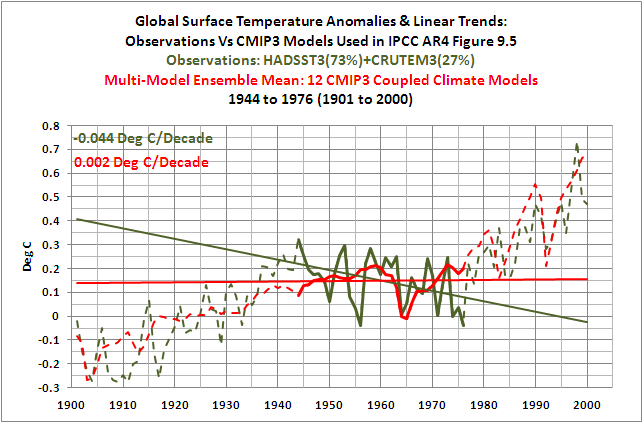 But the majority of this post deals with the SkepticalScience mantra that “CO2 has indeed been the dominant cause of the change in surface temperature over the past century.” For those who have read my post The IPCC Says, “The Observed Patterns of Warming…, And Their Changes Over Time, Are Only Simulated By Models That Include Anthropogenic Forcing” or who have watched my narrated video included in the post The IPCC Says… – The Video – Part 1 (A Discussion About Attribution)the second part of this post will be familiar. I have simply presented that portion of this post a little differently, so if you have studied either of those two posts, you may wish to scroll down through the illustrations and section headings. You will find new information. If not [CO2], what led to this change in temperature? So you don’t have to go chasing links, my post that Roger Pielke Sr. referred to was An Initial Look At The Hindcasts Of The NCAR CCSM4 Coupled Climate Model, which was also cross posted at WattsUpWithThat here. As noted in our previous answer, CO2 has indeed been the dominant cause of the change in surface temperature over the past century. Dr. Pielke has once again failed to make this crucial point in his answer, instead choosing to tell these high school students that the media and IPCC are disregarding the complexity of ‘natural effects‘ (without providing any evidence to support this assertion). 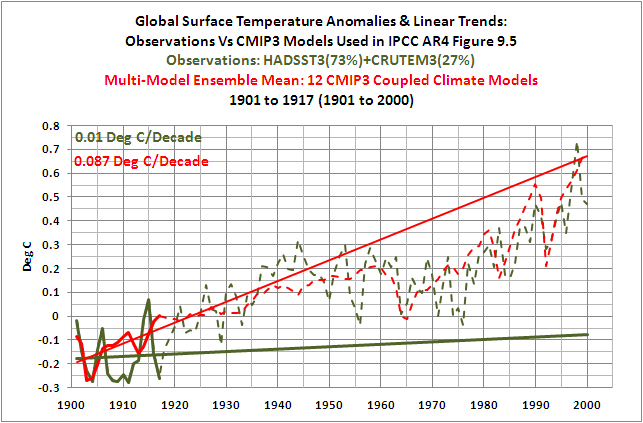 Dr. Pielke then repeats the cherrypicking-based myth that global temperatures are cooling (see Figure 1, and also here and here, where we have already disproven this myth repeatedly for Dr. Pielke), and links to Bob Tisdale’s “skeptic” blog. Why Dr. Pielke links an obscure blog rather than referencing peer-reviewed literature is a mystery, and a climate scientist should be able to do much better. Dr. Pielke appears to be becoming a Tisdale cheerleader despite the fundamental flaws in Tisdale’s weblog analyses. 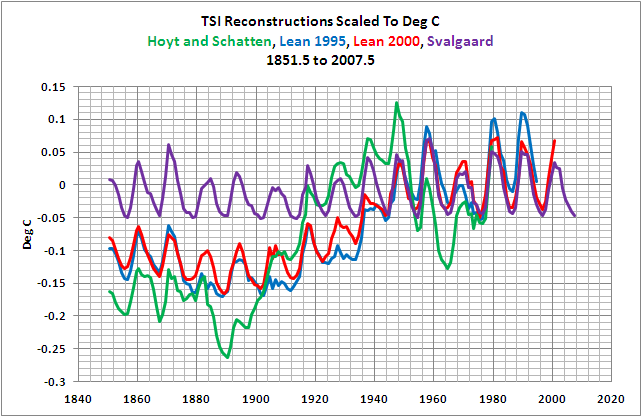 Additionally, Tisdale’s blog doesn’t even seem to support Pielke’s false claim of cooling temperatures. Why Roger Pielke Sr. would link to “an obscure blog rather than referencing peer-reviewed literature is” NOT “a mystery.” Not a mystery at all. Roger Pielke Sr.’s thoughts and opinions about climate change are not dependent on the dogma of CO2-driven global warming—unlike the authors of SkepticalScience posts. Roger Pielke, Sr. does acknowledge that CO2 is one of many factors that impact global surface temperatures. In fact, all one has to do is click on the Main Conclusionslink at Roger Pielke Sr’s blog to determine that. And yes, my blog might seem obscure in the sense that I receive relatively few hits, but SkepticalScience seems to forget, or purposely overlooks the fact, that many of my posts are cross posted at WattsUpWithThat, where page views are about 6 times greater than SkepticalScience. So while my blog may seem obscure to SkepticalScience, many of my posts are not. Now let’s look at the SkepticalScience claim, “Dr. Pielke appears to be becoming a Tisdale cheerleader despite the fundamental flaws in Tisdale’s weblog analyses”. SkepticalScience comment illustrates their inability to grasp topics of discussion. 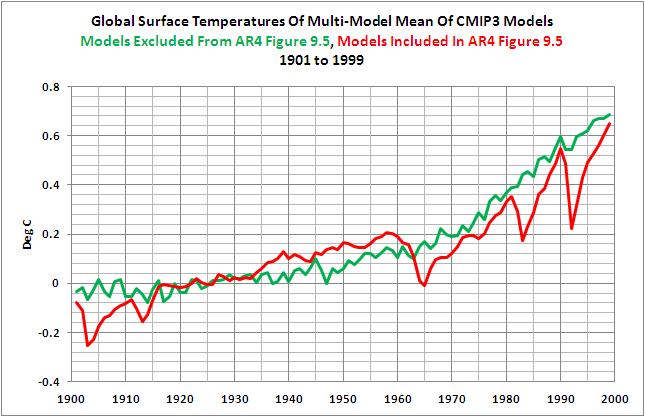 My post that Roger Pielke Sr. linked was about the failings of the NCAR coupled climate model CCSM4. 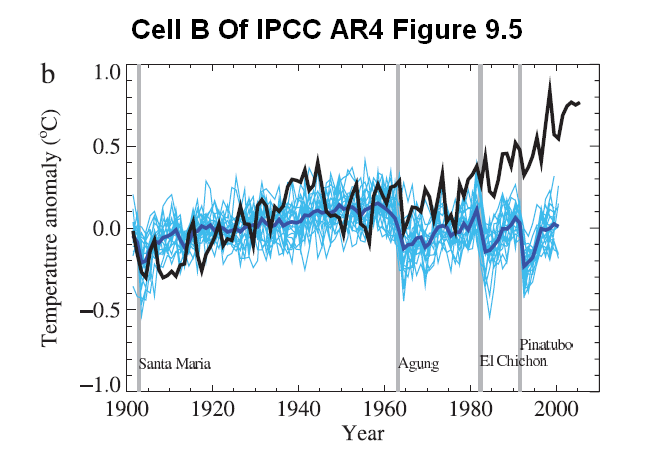 But SkepticalScience linked Tamino’s unsuccessful attempt to criticize my post17-Year And 30-Year Trends In Sea Surface Temperature Anomalies: The Differences Between Observed And IPCC AR4 Climate Models. The post that Pielke Sr linked and one Tamino attempted to critique are on different topics, yet SkepticalScience can’t fathom the differences. Also, I responded to Tamino’s critique with the post Tamino Misses The Point And Attempts To Distract His Readers. It explained the flaws in Tamino’s post. Miscomprehension and misdirection appear to be common faults of, and tactics with, anthropogenic global warming proponents. SkepticalScience condemns Roger Pielke Sr for not referring to peer-reviewed papers, but in the preceding paragraph SkepticalScience, ironically, attempts to refute a claim by Roger Pielke Sr with an illustration based on a blogger’s comment, not a peer-reviewed paper, and based on a dataset, BEST land surface temperature anomalies, that had not been peer reviewed at the time of their post. As of December 7, 2011, the papers associated with the Berkeley Earth Surface Temperature project are still listed as having been “Submitted For Peer Review (October 2011)”, but not peer reviewed. And last, SkepticalScience closes this round of their criticisms with “Tisdale’s blog doesn’t even seem to support Pielke’s false claim of cooling temperatures.” Skeptical Science failed to recognize that my post supported the other portion of Roger Pielke Sr’s answer, which SkepticalScience commented on with “Dr. Pielke has once again failed to make this crucial point in his answer, instead choosing to tell these high school students that the media and IPCC are disregarding the complexity of ‘natural effects’ (without providing any evidence to support this assertion).” [My bold] That is, my post was the evidence supporting Roger Pielke Sr’s comment that the IPCC fails to properly consider natural variables. Yet again, SkepticalScience has highlighted their inability to comprehend a topic of discussion, or has illustrated their need to mislead their readers, or both. That last sentence pretty much sums up the small portion of the SkepticalScience post in which I have interest. Since it’s likely SkepticalScience employed the same tactics throughout the rest of the post, there is really no reason to look at any more of it. But I did want to note that it appears that SkepticalScience failed to consider something even more basic. Dr. Pielke Sr.’s opinions on climate change and global warming are well known. As noted earlier, all one needs to do is click on the Main Conclusionslink on his blog to discover them. Or you can get a feel for his opinions just by reading his blogs posts. Did SkepticalScience ever stop to consider that the high school students and/or teachers who invited Dr. Pielke Sr to respond to their questions were actually looking for replies that did not conform to IPCC doctrine? That possibly they were looking for opposing concepts—ideas from which they could explore other possibilities and learn? Now let’s look at the major flaw in the SkepticalScience post. SkepticalScience makes the claim multiple times in their Pielke Sr. Misinforms High School Students post that Carbon Dioxide is the dominant driver of Global Surface Temperatures over the past century. One was quoted above in the overview, another reads, “CO2 isn’t just ‘a warming influence,’ it’s the main warming driver.” [Their boldface and italics.] And that’s not unusual; many of the posts at SkepticalScience have an undercurrent of CO2 as the primary driver of surface temperatures. One would think SkepticalScience would have checked the global surface temperature record before groaning on and on with the same nonsensical mantra. 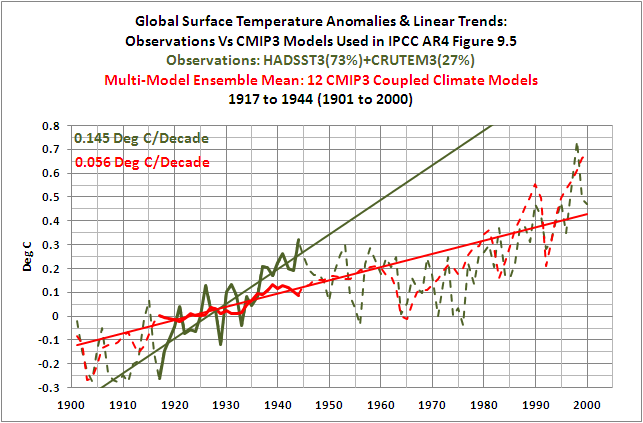 Carbon dioxide is one of the many climate forcings that drive climate models, but climate models do such a poor job of replicating the global surface temperature record, they provide no support for the SkepticalScience assumptions about CO2. If you were to search the SkepticalScience website for posts that refer to the IPCC, you’d get a couple hundred results. Search SkepticalScience for the website RealClimate and you’d find over fifty posts. So one could conclude that SkepticalScience uses the IPCC and RealClimate to support their claims. In the following discussion, I’ll use one quote from RealClimate and four quotes from the IPCC to support mine. And I’ll also support mine with graphs of the observational and model data used by the IPCC that is readily available to the public through the KNMI Climate Explorer. Anyone with a basic knowledge of spreadsheet software, if they were to take the time, can replicate the graphs in this post. Those quotes and illustrations seem to support SkepticalScience’s CO2 mantra. Let’s see if they do, later. A few more quotes first. The observed linear trends of the instrument-based global temperature anomaly data during the early and late warming periods are basically identical. 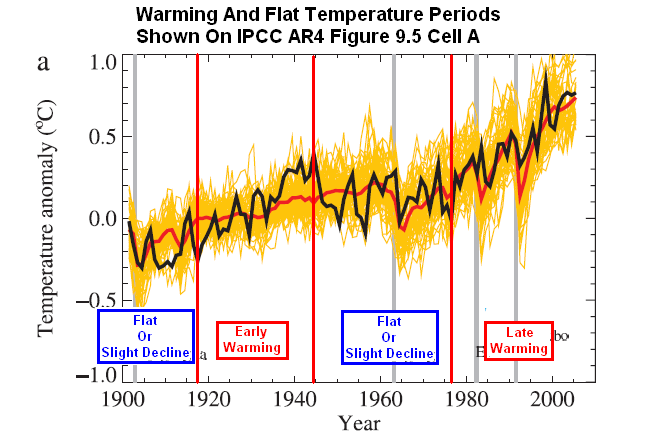 Based on the HADCRUT data, the linear trend of the early warming period of 1917 to 1944 (Figure 8 ) was 0.174 deg C per decade, while the trend of the late warming period of 1976 to 2000 (Figure 6) was 0.176 deg C per decade. 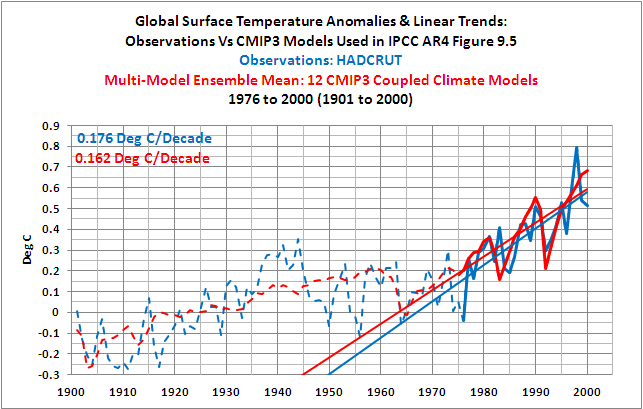 Yet the trends of the model mean, which represents the forced component of the IPCC models, are significantly different during the two warming periods. The trend of the forced component of the models during the latter warming period was about 2.9 times greater than the early warming period trend. In other words, the increase in anthropogenic Carbon Dioxide and other forcings during the late warming period caused the modeled trend to be 2.9 times higher in the late warming period than they were in the early warming period, but there was no change between early and late warming periods in the rate at which observed temperatures actually rose. 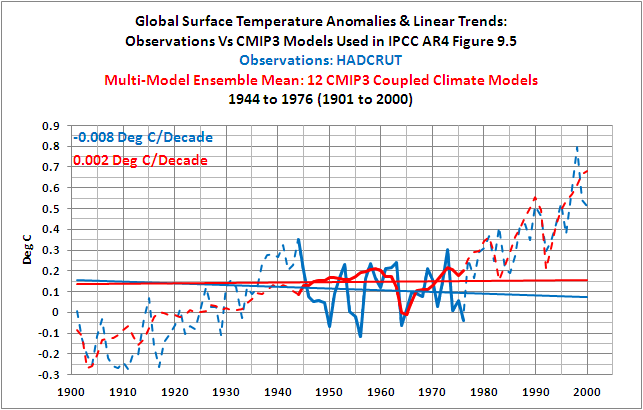 Even more basically, the observed trends in global surface temperatures during the early and late warming periods, because they are the same, do not support the hypothesis of anthropogenic global warming. 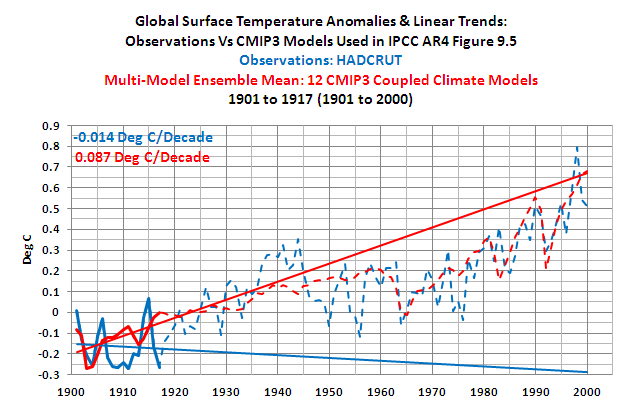 For additional discussions that illustrate the failings of the climate models used by the IPCC refer to the posts here, here, here, here, here, here, here, here, and here. 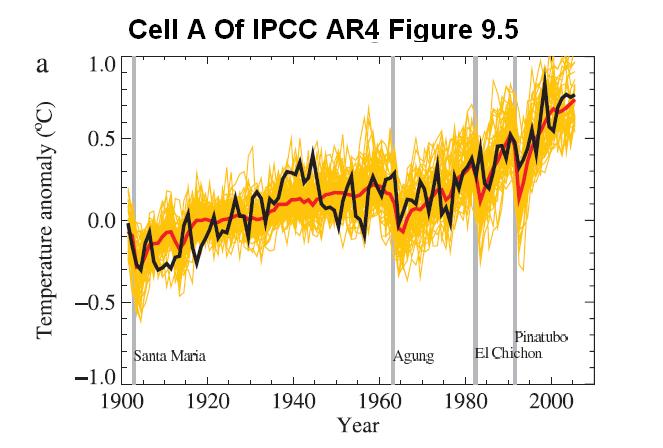 The IPCC, in AR4, acknowledges that there were two epochs when global surface temperatures rose during the 20th Century and that they were separated by an epoch when global temperatures were flat, or declined slightly. Yet the forced component of the models the IPCC elected to use in their hindcast discussions rose at a rate that is only one-third the observed rate during the early warming period. This illustrates one of the many failings of the IPCC’s climate models, but it also indicates a number of other inconsistencies with the hypothesis that anthropogenic forcings are the dominant cause of the rise in global surface temperatures over the 20th Century. 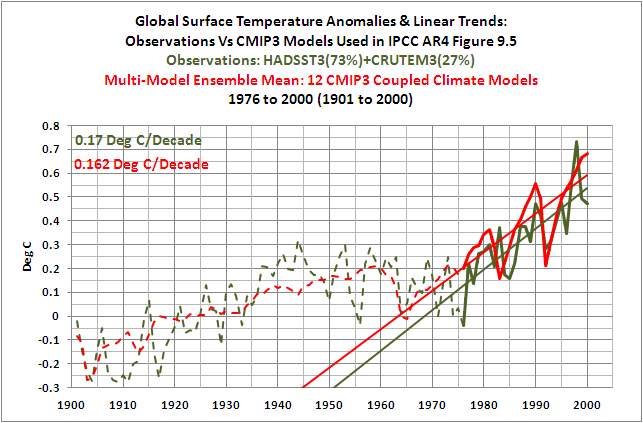 The failure of the models to hindcast the rise in global surface temperatures also illustrates that global surface temperatures are capable of varying without natural and anthropogenic forcings. 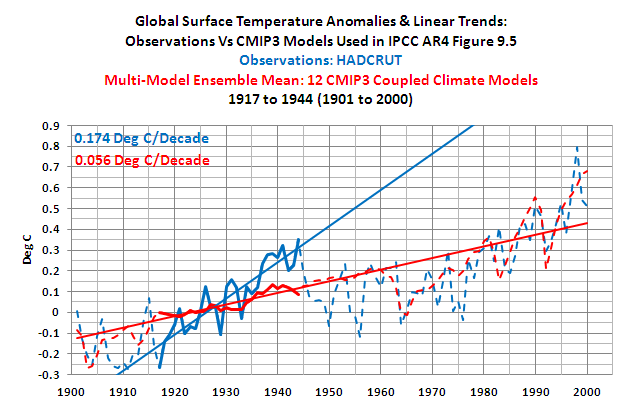 Additionally, since the observed trends of the early and late warming periods during the 20thCentury are nearly identical, and since the trend of the forced component of the models is nearly three times greater during the latter warming period than during the early warming period, the data also indicate that the additional anthropogenic forcings that caused the additional trend in the models during the latter warming period had little to no impact on the rate at which observed temperatures rose during the two warming periods. In other words, the climate models do not support the hypothesis of anthropogenic forcing-driven global warming; they contradict it. The HADCRUT3, CRUTEM3, and HADSST3 data and the individual ensemble members of the CMIP3 climate models used in the multi-model mean data in this post are available through the KNMI Climate Explorer. The HADCRUT3, CRUTEM3, and HADSST3 data are found at the Monthly observations webpage, and the model data is found at the Monthly CMIP3+ scenario runs webpage. 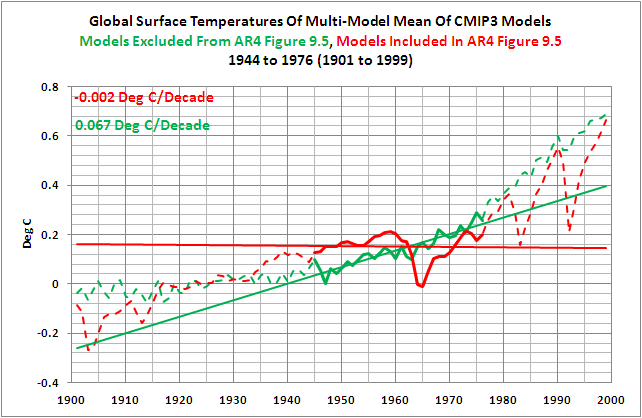 This entry was posted in CAGW Proponent Arguments, Model-Data Comparison SST, Model-Data LOST. Bookmark the permalink. Temperatures are more pseudo science than centrifugal force. Temperatures need many factors to even exist from motion to energy to material. It is in many forms produced through friction or chemical interactions. Pressure on our planet smooths out these exchanges from being too wild in different highs and lows swings. In a complex system of interrelated variables who can say anything is the “main driver?” Such a biased designation in some (many?) cases obscures understanding and may cloud thinking. It speaks to the urge to rank lists of items. That’s okay for Letterman’s Top Ten, or which blog gets more hits ;-), but can impose an unhelpful artificial limitation in science. Not that ranking is bad in all cases; it’s just the subtle shift in thought from “responsible for” to “blame for” that makes it dangerous. Pingback: Recommended Reading – “On the Skeptical Science Post ‘Pielke Sr. Misinforms High School Students’ By Bob Tisdale | Climate Science: Roger Pielke Sr.
Any comments? Unless I am misreading it, they continue the trend of not viewing ENSO as a process – they seem to use only the MEI, which doesn’t show the multi-year effects ENSO can have. I’d love to hear your thoughts – at least this one is a brief paper! Hi John: Your comment “they continue the trend of not viewing ENSO as a process – they seem to use only the MEI, which doesn’t show the multi-year effects ENSO can have” would have been my primary thought. I was going to add the Grant Foster (Tamino) and Rahmstorf (2011) paper to the list of many that can be dismissed because of it. I also found it curious that they were able to coax a solar signal from the data, when there have been numerous papers with different time lags (years to decades) and amplitudes of global response. It was one of the (sort of) hot debates a number of (3 to5?) years ago. There is science and then there is everything else, some call it ‘art’, some call it ‘politics’. Skepticalscience is in the business of everything else including ‘art’, not science, and makes me very skeptical of their ‘science’ and their opinion. Indeed there is more of ‘art’ than ‘science’ in their skeptism, at least in the eyes of this beholder, and more of ‘political ideology’ than ‘good stewardship of the planet’s resources’ in their motivation. Remember this is the same site that said that the Sun was cooling, yet the planets were warming. How that makes any sort of sense just baffles me.